Crafty Garden Mom: "Yucky"/Spoiled Bananas = Banana Bread! "Yucky"/Spoiled Bananas = Banana Bread! 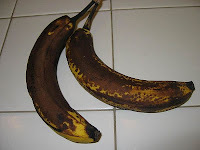 Every other month or so we end up with 2-3 bananas that get overripe and too ugly to eat...you know, the "yucky banana" as my daughter calls them with a wrinkled nose. Sometimes I'm too lazy to use them in some other edible baked good and they end up getting thrown out, but last weekend I couldn't resist my mind visualizing the moist, rich flavor of banana bread savored with a cup of coffee...mmmmm. 1 tsp. baking soda, 1/2 tsp. salt.....that's it! Mash the bananas in a medium size mixing bowl. To the bananas add 1 cup sugar, 2 eggs (beat the eggs before adding them which you can see from the picture I forgot to do..it's all good though I just beat them in the bowl and it was fine), and 1/2 cup oil. Mix well until creamy. together and add to the banana mixture. pans (above) you don't need to grease it..I highly recommend them! Yep, they snagged a slice of it before I could get a "perfect loaf" picture, LOL. Oh well, it's truly THAT GOOD! And so easy...make some next time you have "yucky bananas". You can combine these fruits together without much effort. Bread machine jam cycle recipes generally call for 2 cups of fruit 3 ¼ cups of sugar, and for those that need acid, an extra 2 tablespoons of lemon juice. Oh, boy, this might be the BEST banana bread ever!!! So yummy, Tanesha!